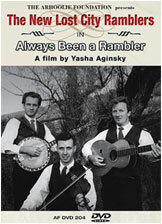 A film by Yasha Aginsky. Also with Dock Boggs, Maybelle Carter, Doc Watson, Elizabeth Cotten, and others. Celebrates fifty years of the Ramblers' music-making. Live footage of onstage performances, rehearsals, and informal music-making are combined with a wealth of archival material.